That’s where the genius folks over at In a Pikle comes in. 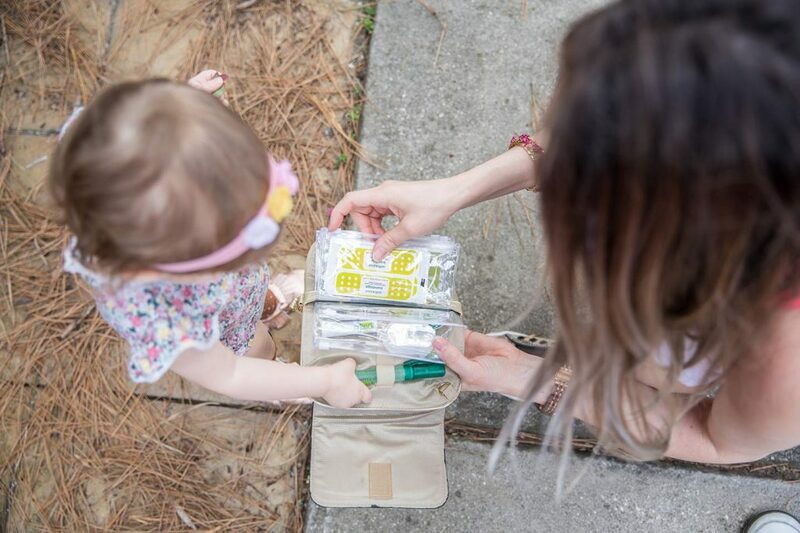 They have designed the perfect mom emergency bag! Capable of holding up to 50+ items. 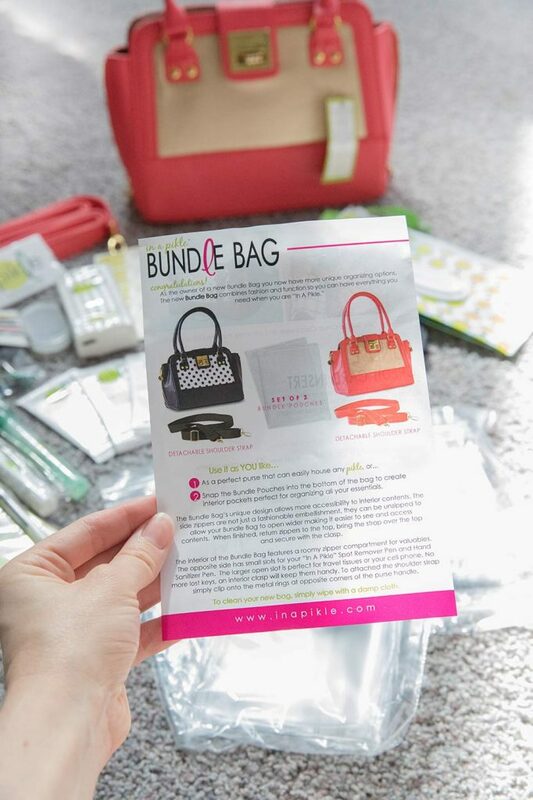 When I was asked to review their products, I was floored by the options of cute bags and helpful save-the-day items they offered. Each piece comes customized and branded with their logo! 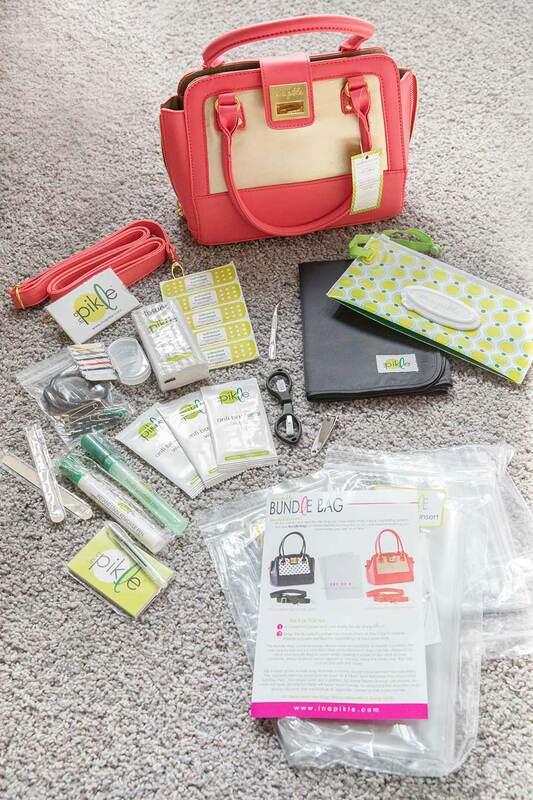 The “Bundle Bag” combines the organizing elements of “The Bundle” with the look of a stylish purse. 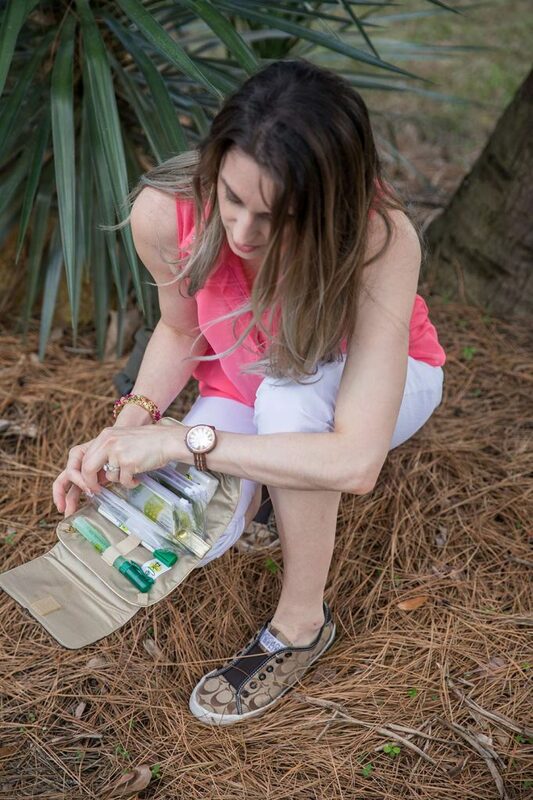 Use it as a purse that houses your “Pikle” or snap the “Bundle Pouches” into the bottom of the bag to create interior pockets perfect for organizing all your essentials. The “Bundle Bag” is made from a smooth faux leather with gold plated accents including an “In A Pikle” engraved bag clasp. 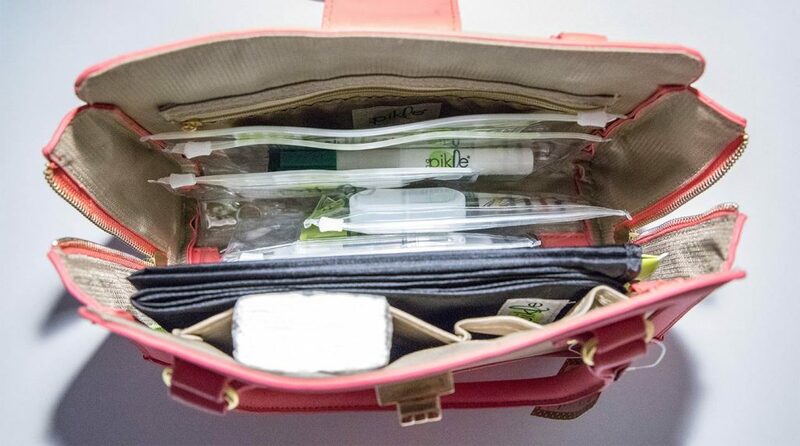 The interior has a large zipper pocket on each side and a series of small pockets on the other side that can house pens, the “In A Pikle” hand sanitizer or spot remover pen and even your phone. Measuring 10″ x 8″ with sides that unzip for added accessibility to everything inside there is plenty of room for many “In A Pikle” a’la carte items. The “Bundle Bag” comes with 2 double sided interior pouches and a detachable, adjustable shoulder strap that measures up to 57″ in length. Finally, making sure everything has its place, the interior snap latch feature will keep your keys handy so they are never lost (product description off the site). 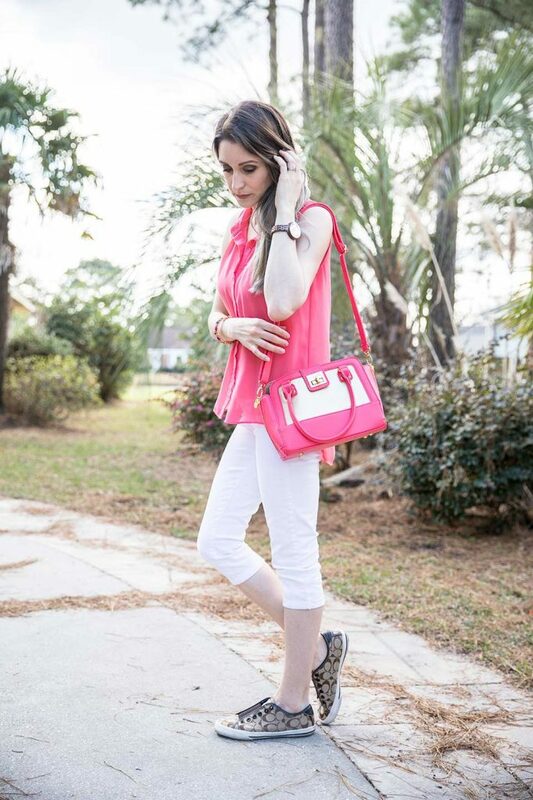 I have to say one of my favorite things about this bag is the side zips! They make it so easy to find everything! The Relish Pikle is feminine and glamorous! Perfet for a night out or anyone who loves to lie in high style. 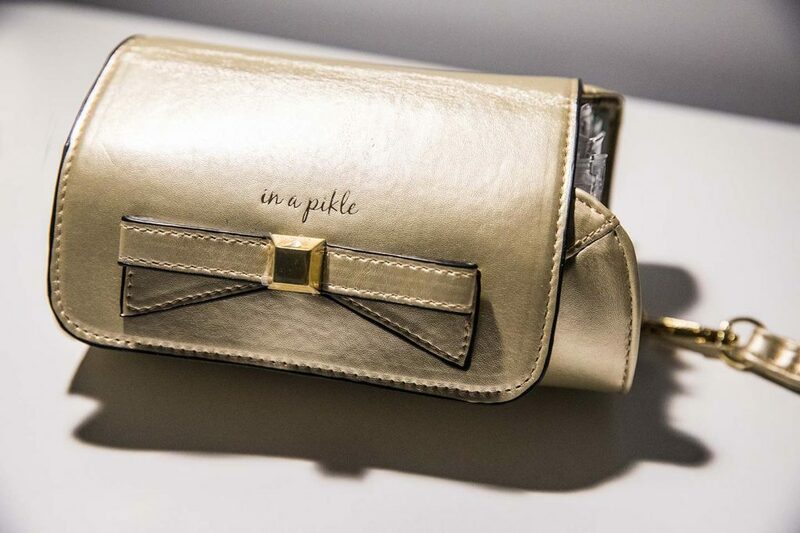 Available in an energetic metallic gold faux leather, this style features a little added bling with our signature “In A Pikle” embossed logo and embellishment in gold. The “In A Pikle” bag is approximately 10″ x 7″ open and 3.5″ when closed. 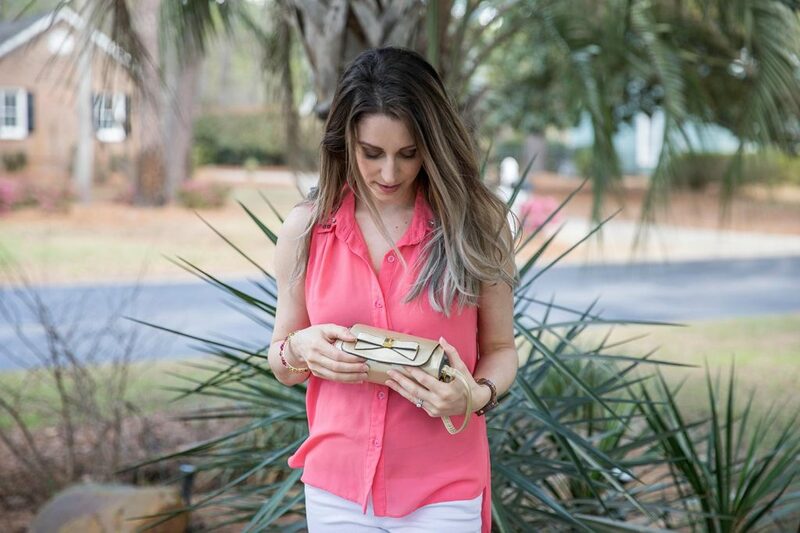 Relish in having all you need in this stunning little clutch. 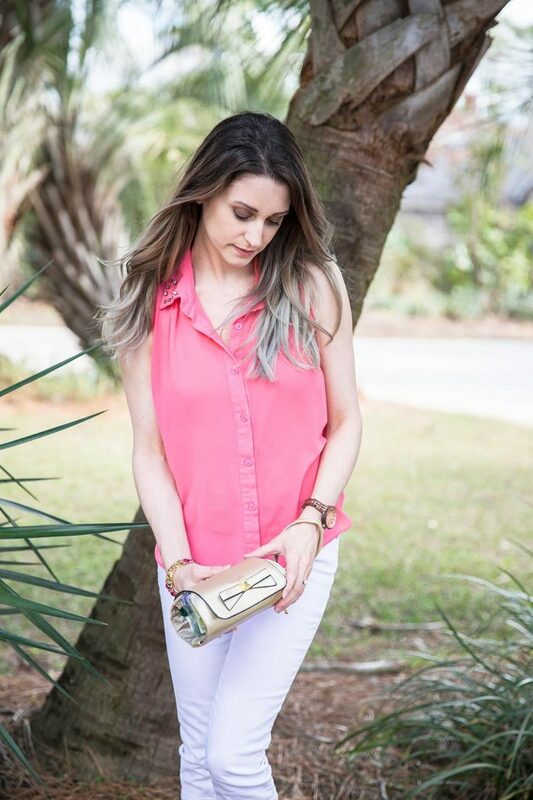 Add the optional shoulder strap that extends up to 57″ turning this Pikle into a convenient cross body purse perfect for an evening out (product description off the site). 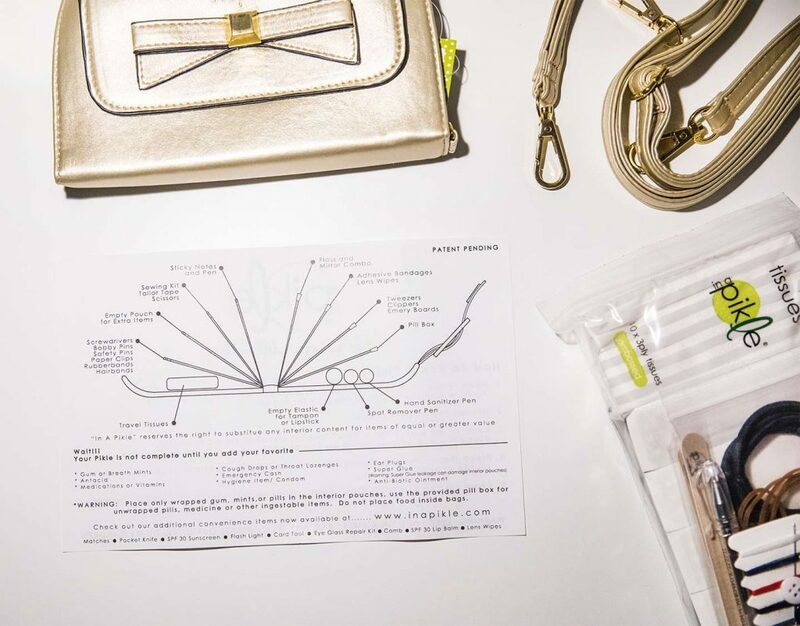 This cute clutch comes with instructions on putting your bag together, suggesting the best places to put the products! I recently had the bag save the day when my daughter got a boo-boo. Luckily, I had my “In a Pikle” bag and just what I needed to access and fix the situation! We’ve all found ourselves in a pickle at times! These are the moments you never expect and are not prepared for! A spill on your shirt, a missing button, an unsightly chin hair, a torn finger nail, or lunch stuck in your teeth. 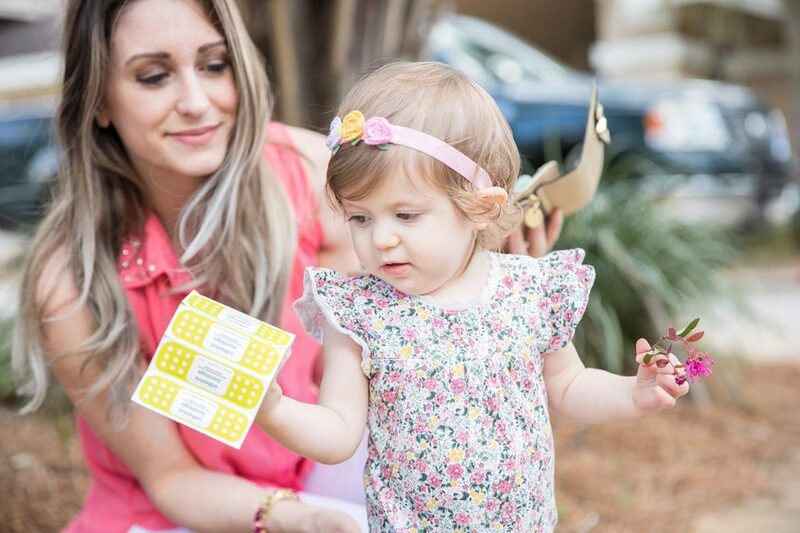 If you have children, you have more unique challenges ranging from nose bleeds to skinned knees. 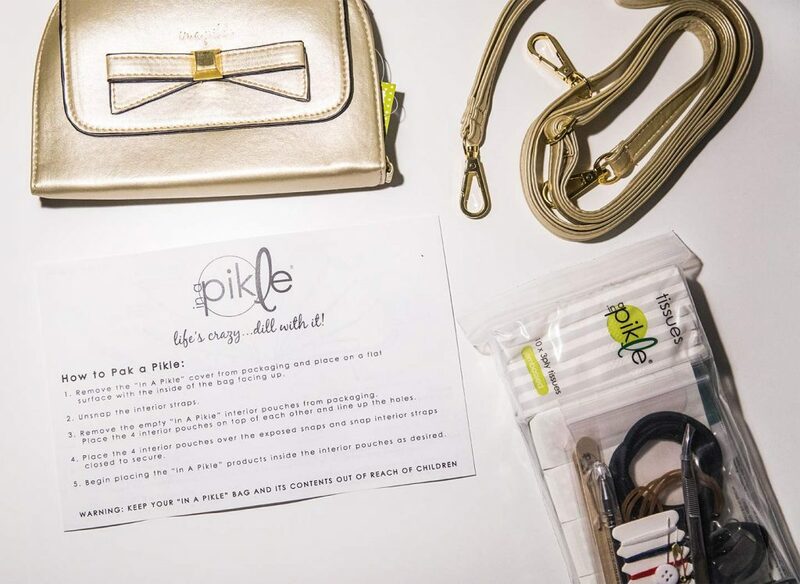 The “In A Pikle” bag (or more frequently referred to as the “Pikle”) is a compact organizer for essential convenience items needed for the daily emergencies of life. It is camouflaged to look like a designer wallet. Inside are 8 clear, removable pouches that attach to the fashionable cover. It is designed to hold a stain remover pen, bandages, nail clippers, tweezers, safety pins, and much more. Women have many of these items at the bottom of their purse, but can never find them when they need them! Finally, there is a way to organize daily emergency items in a fun and stylish way. The “Pikle” comes in many trendy designs and fun colors providing something for every taste. With the “Pikle”, you’ll be able to successfully get out of almost any situation (product description off the site). I love the gold one! That’s insane how many items you can store in there! Ordering NOW! 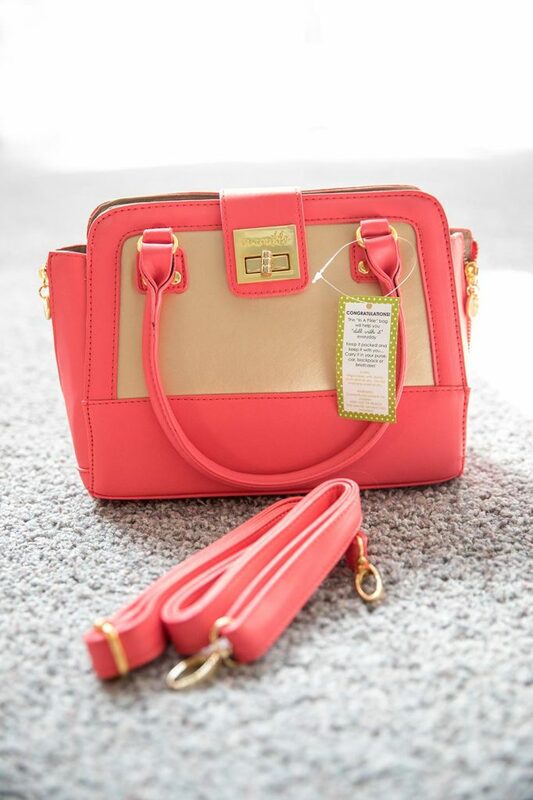 Hi, i fell in the name straight away as for the colour of the main bag I’m sold and the little bag is so cute. Oh and they are obviously designed to be practical with all the little slots and compartments. I want 😊. I love these bags, especially the pink one! They are so beautiful yet efficient. I love the fact that all these items come in cute bags and purses! So fashionable!